On Saturday May 6th at 3:00PM EDT, please join me (Mags), DNA Guru Peter Roberts, special guest WikiTreer and genealogy blogger, Kitty Munson Cooper, along with Julie Ricketts, for a live chat on “WikiTree and DNA – DNA Features on WikiTree”. This is the third in the WikiTree and DNA Series and goes along with some of the changes going on with the DNA Project. Join the chat to ask us DNA Features questions. Pull up a chair to watch or ask questions in the LiveCast chat, either way we promise an hour of WikiTree fun! If you want to see a complete list of past and future LiveCasts follow this link. April 15, 2017 – 3:00PM EDT:WATCH LIVE – The Rangers Project with the Forest Elf, Eowyn Langholf. Oh you know the Forest Elf has things to talk about. Not only does she keep the nutrients flowing into all of our branches from the trunk, she helps keeps our Tree healthy by leading the Rangers Project. Ever wondered what the Rangers do in our Tree? Tune in and hang out while we discuss this group of WikiTree Protectors. The Scottish Project with Doug Straiton. We will discuss the Scottish Project and throw in a good measure of all things UK while we have him. Doug is Also a Military Guru too, so bring your questions and we will see if he can answer them all. April 1, 2017 – 3:00PM EDT: WATCH LIVE – The Profile Improvement Project with Bob Kenniston and award winning author and editor, the Book Doctor, Bobbie Christmas. The Profile Improvement Project with Bob Kenniston & the Book Doctor. We will chat about the Project and some of the nuts and bolts of Profile improvement on WikiTree. Then we will throw in a bit of Professional Writing help from the Book Doctor herself, award winning writer and editor, Bobbie Christmas. March 25th, 2017 – 3:00 PM EDT: WATCH LIVE – One Name Studies and All things Doug Lockwood. Doug will join us to talk about all the things he does on WikiTree, but most importantly he’ll discuss his one Name Studies. How are One Name Studies on WikiTree different than anywhere else? How to set up a One Name Study, where to find people to help with your One Name Study and How to tie-in the ever important Surname DNA Study. March 18th, 2017 – 3:00 PM EDT: WATCH LIVE – Getting Started with DNA with Peter Roberts. Why should I get me DNA tested? Where should I get my DNA tested? What kind of DNA test should I take? We will answer all of those questions for you during this WikiTree LiveCast. Information you need to know before jumping into the Gene Pool with the rest of your DNA Cousins. LiveCasts, RootsTech2017, and Client Work, Oh My! It has been a crazy fun start to this year. Gearing up for RootsTech 2017 while doing Client work, including wrapping-up and finalizing a research report (did I include that bit I found 6 months ago?) and producing LiveCasts. It’s been more than crazy. My 21 year old descendant called last night wanting to know if I might run him over to a grocery store. The store is walking distance from his apartment, but he wanted to do a big shopping trip and wanted to have help with his trek, via Grandma’s Genes Fleet Vehicle #1, Bernadette the van. Earlier this week I saw a cartoon with a diagram of how women shop – a continuous line down every Isle – and the way Men shop – one straight line to a point in the store and out again. I haven’t been grocery shopping with my 21 year old in years, so I had visions of the “in, get the item, and get out” version of Man Shopping on my mind. First off he didn’t want to separate. We, together, made four trips through the produce section. One trip through the sandwich meat section and when we got to the main section of Isles? It was a free-for-all of bouncing back and forth through the isles in a MOST UN-organized way. I felt as if I was moving in slow motion to find my few items while this 21 year old man spun wheelies around me in a frenzy. Did he find what he was looking for? He did. Was it efficient? No. Did it get the job done? Yes. Did I get dizzy? Not exactly, but I had fun. 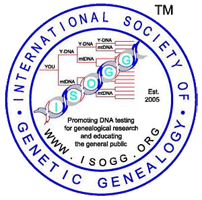 In working to complete a Genetic Genealogy Research Project for a Client, I found myself doing what I always do, Looking back through and reviewing every bit of research I had done. Not terribly in-depth, but enough to make sure I hadn’t missed anything. Working meticulously, I went down the list, checking my report against the research, making sure I had said what needed to be said, checking citations and acknowledgements and rewriting sections of the Genetic Genealogy Research Project. I had started the report the day the client hired me and worked it as I worked the research. While working on the “Suggestions For Further Research Section” I got lost. I started looking into the things I would look into if more research was requested by the client. How is Rochester, New York connected to the Client’s family? When did the Underground Railroad Begin? Was it prior to the 1840’s? It would need to be prior to the 1840’s for the clients ancestor to have traveled it. How did Slaves get to Port Hope, Ontario Prior to 1826? Could the family have a connection to Loyalist Slaves? Is there such a thing as a Loyalist Slave? Funny how real life is mirrored in real life. Today I realize what happened. 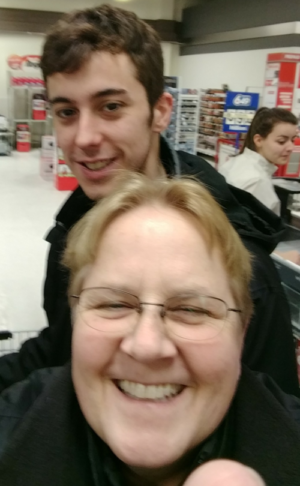 I had jumped the rails and become my 21 year old son in the grocery store, popping wheelies with the cart…I stopped and pulled myself up and out of that rabbit hole/21 year old man grocery shopping trip. This week we have Aleš Trtnik dropping by to chat about WikiTree DataBase Errors and the Data Doctors Project. Visit the schedule of upcoming WIkiTree LiveCasts for more. Then there is the impending trip to RootsTech 2017. This is the largest Genealogical conference in the world. Everyone is there who can get there including all the heavy hitters in the Genealogical industry. The conference has a a slant towards the technical with an innovators summit and competition for the best and brightest new ideas. This will be my third year at RootsTech. If you are there look for me. I will be one of the ones wearing orange and hanging out around the WikiTree booth. Yes Grandma’s Genes is combining the two! Our LiveCast featuring Kitty Smith and Peter Roberts and all things DNA will be live from RootsTech 2017. If you are at the Salt Palace, we will be live at 1:00 PM (3PM EST). We are hoping to be able to do the LiveCast at the WikiTree Booth, but if connectivity is an issue we might be somewhere else. If you swing by the Booth someone can direct you to where we are. Free Hugs for anyone who finds me! Author magsPosted on February 2, 2017 March 15, 2017 Categories GenealogyTags Genetic Genealogy, Research report, wikitree livecast2 Comments on LiveCasts, RootsTech2017, and Client Work, Oh My!